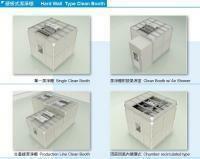 The design of Clean room separates reverse engineering and development teams to create a clean technology environment. Small competitors with budget limitations or lacking innovation may use clean room design to compete with large product and technology enterprise counterparts. The design and installation process is complicate, especially if it involves maintaining production within an existing facility during alterations, expansion and construction. 4.Easy to assemble and disassemble for relocatingApplication:Installation of an enclosure in general working environment, in order to define acontrolled environment to prevent the pollution from the surrounding. thefilling/packing area for food processing manufacturer or the product storage for othermanufacturer. 5.Easy to assemble and disassemble for relocatingApplication:Installation of an enclosure in general working environment, in order to establisha clean environment to create clean room and to prevent the pollution from thesurrounding. the packing/assembly or product storage area for foodprocessing, pharmaceutical and microelectronic manufactures. 5.Easy to assemble and disassemble for relocatingApplication:Installation of an enclosure in general working environment, in order to establisha clean room with controlled temperature and to prevent the pollution from thesurrounding. 5.Easy to assemble and disassemble for relocatingApplication:Installation of an enclosure in general working environment, in order to establisha clean room with controlled precise temperature and humidity, and to prevent theimpact from the surrounding. the critical production area for bio-tech andmicroelectronic manufacturers.